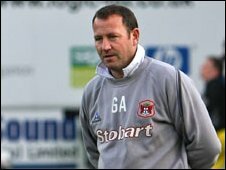 Carlisle United have appointed Greg Abbott as manager on an 18-month contract after a short spell in charge as caretaker. The 44-year-old, who has led the side to three wins in six games, replaces John Ward who left the club last month. "This is a really exciting opportunity for me," Abbott said. "I can guarantee to everyone who has Carlisle United in their hearts that I will do everything in my power to bring success to the club." It is a case of second-time lucky for Abbott, who failed to earn the manager's job on a permanent basis last year after a spell in caretaker charge. Abbott informed the Cumbrians' first-team squad of his appointment at Cheltenham Town's training ground ahead of Saturday's League One game at Swindon. The club's chief executive David Allen said: "Everyone at the club is convinced that Greg is the right man to lead Carlisle United forward. "There was never any firm timescale set over appointing a new manager. We were determined to make the right decision for the club and not rush into anything. "But Greg knew he would be given a fair crack at earning the job himself this time and our thoughts always came back to him. " Allen revealed that several high-profile managers had applied for the position following the departure of John Ward in early November. "We had a lot of very good applicants for the job to consider, including many from established and experienced managers, some of who are in good positions with other clubs at the moment," he said. "It is very reassuring that these people regard Carlisle United as a good club to work at. Abbott had a 10-game stint in the caretaker role at the beginning of last season after the dismissal of Neil McDonald. Have Carlisle made the right appointment? He began his playing career with his hometown club Coventry City before spells with Bradford City, Halifax Town and Hull City before joining Carlisle in 2006 following a spell as youth-team coach at Leeds United. Allen added: "Everything Greg has put in place over the last month, both on and off the pitch, has demonstrated that he is the right person for the job. "We looked at how well Greg did in his first spell as caretaker-manager at the club last season and at the changes he has been making this time and his whole attitude to the job. "We firmly believe that Greg now deserves his first chance at being a first-team manager and we are delighted to give him that opportunity at Carlisle United as from today."